Ryan grew up in South Florida where he was exposed to some of the premier pet facilities in the world. Although he didn’t know it at the time, these facilities would eventually become the inspiration for unFURgettable Pet Resort & Spa, planting the seed in his head as to what the standard for pet care should be. After high school, Ryan attended Boston University for one semester before being signed to play professional soccer by Almere City FC in the Netherlands. After his playing career was over, he returned to BU and graduated, fulfilling a promise he made to his family. It was also during this time when he met his wife Cynthia. After graduation, he then chose to follow his father’s footsteps and spent the next 8 years as a songwriter for Sony BMG. But his love for animals was just too strong and this led him to his current position as President/Owner of unFURgettable! Cynthia’s love for animals knows no bounds and this shows in the way she treats every pet at unFURgettable as if they were her own. A self-proclaimed “crazy cat lady”, she has been around both cats and dogs her entire life and currently has two cats at home, Musa (Siberian) and Yogi (Himalayan). In 2010, she graduated from Boston University with a major in International Relations. It was also during this time that she met her husband, Ryan. In 2013, she earned a Masters Degree in National Security Affairs from Nova Southeastern University. In 2016 she received her law degree from Suffolk Law School and became a member of the Massachusetts Bar only one year later. Presently, Cynthia does business immigration law for one of the top firms in the world. But just like Ryan, she simply couldn’t ignore her overwhelming love for animals and decided to open unFURgettable where she is the the Vice President/Owner! Mary Lou is the business mind and the engine which keeps unFURgettable running. Without her hard work, selfless dedication, and unwavering love for the animals, the unFURgettable ship would have sunk before it ever left the port. In 1973, she graduated from nursing school in Montreal, Canada where she was born and raised. For the next 7 years, she would work as a nurse at Montreal General Hospital while also working a second job as a paralegal. In 1985, she not only gave birth to her son Ryan, but also founded, along with her husband Steven, Cryntel Enterprises where, still to this very day, she holds the title of Vice President/Owner. During Ryan’s career as a songwriter for Sony BMG, she took on the role of managing all of his publishing responsibilities. It’s safe to say she might be Superwoman in disguise. Throughout her life, Mary Lou has constantly been around and cared for animals. While living in Washington DC, she rescued a cat named Sonya who had been run over by a truck, nursing her back to health after surgery and eventually adopting her permanently. It was this kind of love for animals that encouraged her to join Ryan and Cynthia in opening unFURgettable as General Manger/Owner! Simply put, in the animal care community, Mike is considered a superstar amongst his peers. He came to unFURgettable with decades of experience, having run some of the most well-known facilities in the state of Massachusetts. After 5+ years of leading one of the biggest resorts on the east coast, he moved to the South Shore and is thrilled to be the face of the unFURgettable team. Mike and his wife Shannon, an integral member of the MSPCA, both have a history in fostering animals. Both of their pets at home, a cat named Taco and an 11-year-old Pug/Beagle mix named Bean, are rescues. Despite the shelter labeling Bean as “un-adoptable” due to his many medical conditions, Mike and Shannon never gave up on him and now we’re happy to report he’s doing great! Bean happily became the official host dog of unFURgettable, greeting each new guest at the door to make them feel more comfortable in their new setting. Each year, Mike’s wish is to hug every dog in the world and he feels like this is the year it may finally happen! Kayla is extremely unique simply for the fact that her background includes grooming not only for pets but for humans as well. It’s safe to say the art of beautification is her passion. From 2007 to 2011, she attended Southeastern Vocational Tech and earned a degree in Cosmetology. However, she says that soon after graduation she realized grooming pets is what she truly wanted to do. For the last four years, Kayla has gained invaluable experience and developed extensive knowledge while grooming dogs and cats of all breeds. She’s an expert in bathing, brushing, drying, nail trimming, teeth cleaning and styling. Kayla also loves educating her clients and giving them valuable information to take home so their pet’s coat can look beautiful all year long! 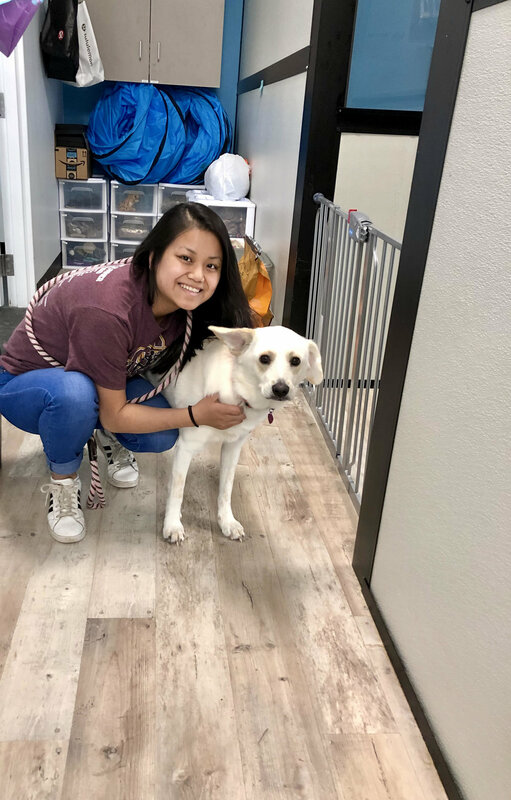 A self-proclaimed animal lover, she says, above all else, her focus is the safety of the pets and maintaining a healthy level of comfort by keeping stress levels to a minimum. It’s a common occurrence to walk by the grooming room and hear Kayla humming a soothing melody to the pets on her table. She truly treats each and every one as if they were her own. Kayla works Monday, Tuesday, Thursday, Friday and Saturday. Word is starting to spread and her calendar is filling up fast so don’t hesitate to book your appointment! To say finding John was a blessing would be an understatement. The safety of our pets is and always will be our top priority and therefore it was a must for us to have someone in the building to care for the overnight guests after lobby hours. However, we feared it would be difficult to find someone who wanted the “graveyard” shift so when John came to us and asked specifically for this role, we were overjoyed. John graduated from UMass Dartmouth in 2018 where he played football. He’s currently the head coach of the girls volleyball team at Pembroke High School, largely considered one of the best teams in the state, and was recently honored by the school for his exemplary performance on the job. He has over 15 pets at home (he might have lost count at this point) and has been around both cats and dogs his entire life. He openly admits he has an exceptionally large soft spot for Golden Retrievers but also says he can never get enough of pets in general! John is a Philadelphia Eagles fan but we won’t hold that against him! Nicki is an extraordinary individual who never ceases to amaze us and unFURgettable is extremely lucky to have her. Not only is she one of the hardest workers we’ve ever witnessed but her genuine love and devotion to the animals shows in everything she does. While attending Scituate High School (she graduates this year), Nicki taught figure skating lessons at Winterland Skating School where she gave group lessons and also choreographed routines, traveled to competitions, and managed the skating careers for her individual skaters. Shortly after, she showed the initiative to start her own dog sitting company based out of Cohasset where she cared for the dogs of owners who were on vacation or simply needed a quick check-in while they were at work. She came across dogs of all ages and says this helped build her experience tremendously. Nicki is also an avid clothes designer and loves to sew. We recently learned she has been accepted by multiple prestigious universities and we couldn’t be prouder of her. The owners of unFURgettable frequently say if they had a daughter, they’d be honored if she turned out to be like Nicki. Earl, comes to unFURgettable as an incredibly accomplished individual. From 1990 to 2001, he was a Combat Medic in the U.S. Army. where he ran a field emergency room that triaged soldiers before sending them to in-patient care. He also instructed service members in first aid, CPR, and tourniquet administration, providing medical assistance to 60-100 soldiers. For his outstanding work, Earl received 3 Army Achievements. During his time in the Army, Earl was also a clinical coordinator for REACH Inc, a non-profit service agency providing residential and everyday life services to adults with developmental disabilities and in 2007 he earned an Associate in Science in Pre-Nursing from Quincy College. Earl describes himself as a “cat person” but loves all animals and it’s obvious that the feeling is mutual. When he came to interview at the resort, one of our pet guests walked into the room, ignored everyone else and went straight to Earl to sit by his feet. We all knew it was a sign and we hired him right away. Earl, along with John, is an overnight technician at unFURgettable, caring for our pets after lobby hours. We thank him for his service and we feel very fortunate he chose to join our family! We couldn’t be more excited to introduce Kylie, the newest member of unFURgettable! Originally from Ohio where she worked as a lifeguard for her town’s YMCA, Kylie moved to Massachusetts to pursue a higher education at Quincy College where she’s currently studying Visual Fine Arts. She says that while she has always aspired to be an art teacher, it has also been a lifelong dream of hers to work with animals. Before joining us, Kylie was working for Rover as a pet sitter/dog walker and says that she has owned cats, dogs, fish and mice. Kylie has a connection with our pet guests that is hard to put into words. Every member of our staff is an animal lover and treats each pet as if they were their own, however Kylie takes pet care to another level. She is completely and utterly devoted to the animals that walk through our doors and she goes the extra mile to make sure they feel loved. After lobby hours, it’s a common occurrence to see her sitting in the room of an overnight guest and staying with them until they feel comfortable enough to fall asleep. It’s that kind of dedication which makes us feel very lucky she chose to join unFURgettable and we couldn’t be prouder to have her as part of the family!